Map showing the area where the Okeanos Explorer will conduct operations during the Caribbean mapping expedition, as well as the site for the glider deployment. Map created with ESRI ArcMap software. High-resolution bathymetry data shown compiled by USGS (Andrews et al. 2014 ) Download larger version (jpg, 1.4 MB). 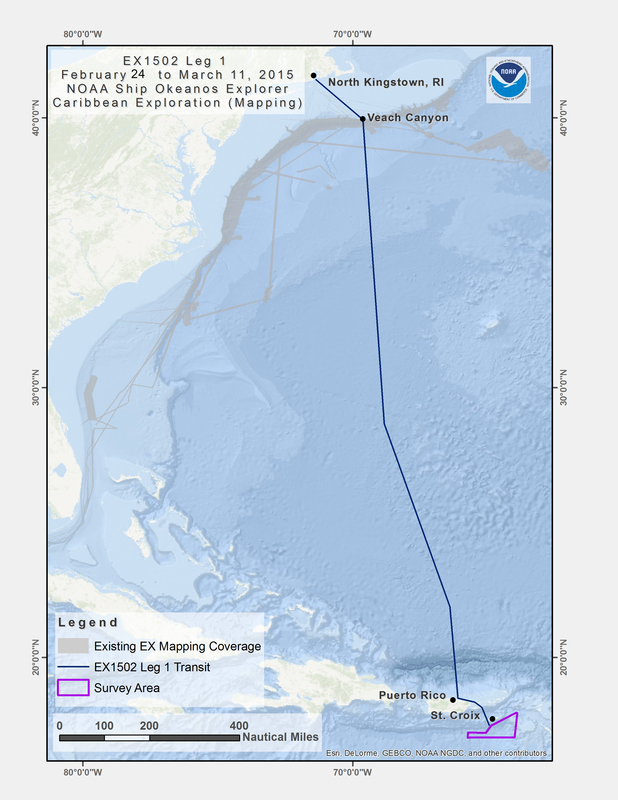 From February 24 – March 11, 2015, NOAA Ship Okeanos Explorer will conduct a mapping expedition, beginning in North Kingstown, Rhode Island, and ending in San Juan, Puerto Rico. In the Caribbean Basin, numerous deepwater submarine canyons and valleys are located just miles offshore of Puerto Rico and the U.S. Virgin Islands. Despite the potential for these features to contain valuable and vulnerable ocean resources, we know very little about them, making this an important area to map and explore. 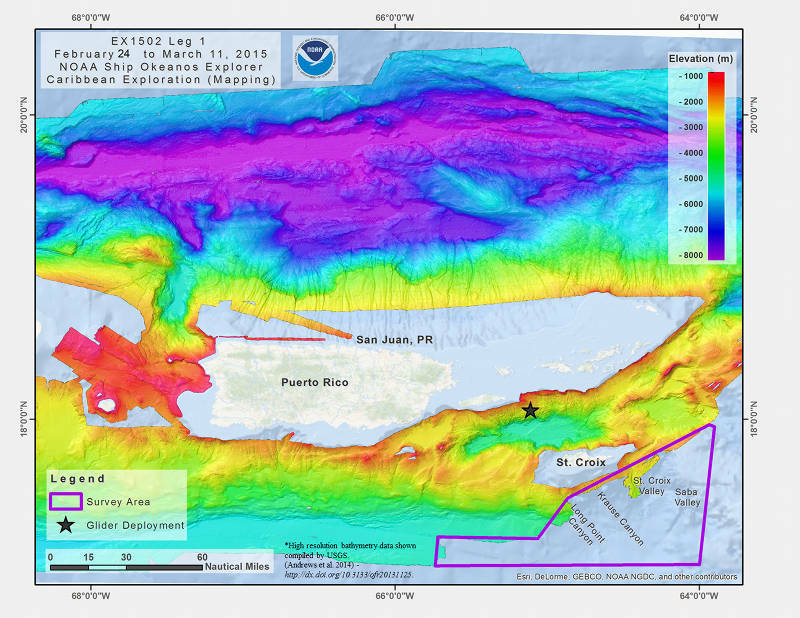 Data collected during this expedition leg will provide high-resolution base maps of poorly known deepwater regions around Puerto Rico and the U.S. Virgin Islands. The area around Puerto Rico and the U.S. Virgin Island was identified and an area of high priority for exploration during the 2013 Caribbean Basin Workshop held by the Ocean Exploration Trust and the NOAA Office of Ocean Exploration and Research (OER). Specific exploration targets were established in consultation with members of the ocean management community and numerous federal and territorial partners, including the U.S. Geological Survey (USGS), NOAA’s National Centers for Coastal Ocean Science, NOAA’s Deep Sea Coral Research and Technology Program, the Caribbean Fisheries Management Council, Puerto Rico Sea Grant, Univeristy of Puerto Rico, and the Puerto Rico Departamento de Recursos Naturales y Ambientales. Map showing the area where the Okeanos Explorer will conduct operations during the Caribbean mapping expedition, as well as the site for the glider deployment. Map created with ESRI ArcMap software. Image courtesy of NOAA Office of Ocean Exploration and Research. Download larger version (jpg, 2.7 MB). While on transit from Rhode Island, NOAA Ship Okeanos Explorer will be continuously collecting mapping data throughout. During this leg of the expedition, the Okeanos Explorer Mapping Team will conduct a patch test to calibrate the multibeam sonar. The results of this test are used to determine angular offsets between the multibeam sonar array and the instrument that measures the ship's motion. Pitch, heading, roll, and timing values are established and then applied in data collection software, ensuring that the seafloor measurements collected on the ship are accurate. In the Caribbean, mapping will be focused in an area southeast of St. Croix Island that extends upon coverage already collected by the USGS. Features that will be mapped in high resolution include Long Point Canyon, Krause Canyon, St. Croix Valley, and Saba Valley (see survey map above). Seafloor bathymetry, seafloor backscatter, and water column backscatter data will be collected continuously while underway. Sub-bottom stratigraphic data will also be collected during the expedition. Additionally, Expendable Bathythermograph (XBT) casts will be conducted regularly to measure the speed of sound through water. Sound speed profiles are used to correct for the bending of acoustic beams as they travel through the water column. During the mission, you can view a live video stream showing the multibeam sonar mapping work in action by checking our website. As part of a partnership project between NOAA’s National Ocean Service (NOS) and the U.S. Naval Oceanographic Office, NOS staff onboard NOAA Ship Okeanos Explorer will deploy one Slocum glider in the vicinity of the Virgin Island Trough. Underwater gliders are a type of autonomous underwater vehicle that can typically travel far distances over long periods without servicing. The glider deployed from the Okeanos will record oceanographic conditions, providing near real-time observations for use in oceanographic current models in poorly studied regions of the Caribbean. The gliders will also carry passive acoustic recorders to record ambient noise such as sounds made by fish and marine mammals, as well as human-made sounds from ships and other sources. Bioacoustic data may help in identifying and locating reef-fish spawning aggregations for grouper species and other fishes.